Pete & his team would love to welcome you to our 4th Chocolate House on Carfax in the centre of Horsham, opened in Spring 2018! Explore our shop area to browse our full range of multi award-winning fresh chocolates, including our gin chocolate made in collaboration with Horsham's Cabin Pressure Spirits. Choose which chocolates you would like to fill a selection box or even fill a box made of chocolate! You can also discover all our other handmade chocolate gifts (many of which are vegan-friendly) including; studded slabs, bars, dipped dried fruits, chocolate fish & chips (yes you read that right), ducks, dinosaurs and seasonal goodies. The team will be happy to help answer any questions you may have on all things chocolate to help you select the best gift. Why not take some time out to enjoy our unique hot chocolates from different cocoa origins around the world, from 45% to 100% (sugar-free) cocoa. All our hot chocolates from 70%-100% cocoa can be vegan-friendly as we offer a selection of plant-based milks. You can also enjoy a range Sussex-sourced food & drinks, including coffee & tea. We have a range of seating including some comfy chairs, a big sharing table & even a tiny picnic table for little people in our back room! 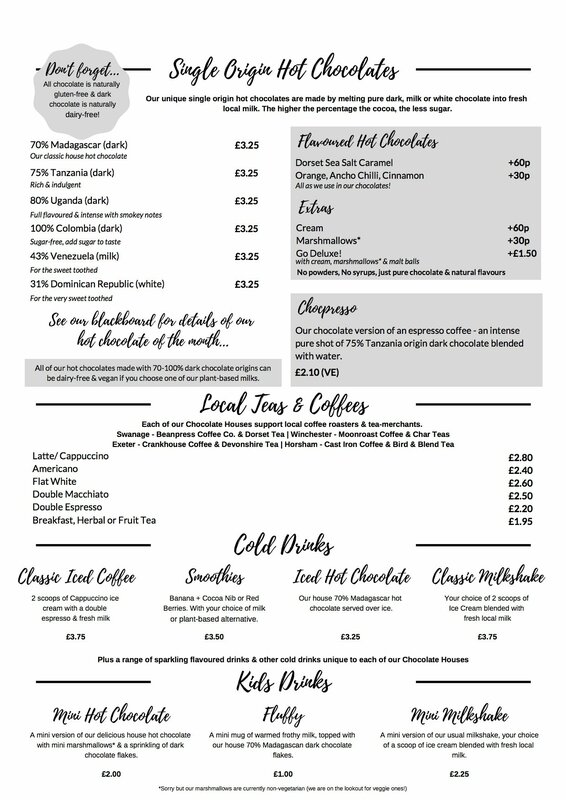 We are proud to work with such fabulous local producers as Cast Iron Roasters coffee, Bird & Blend Teas, Wobblegate juices and Coburn & Baker cakes. 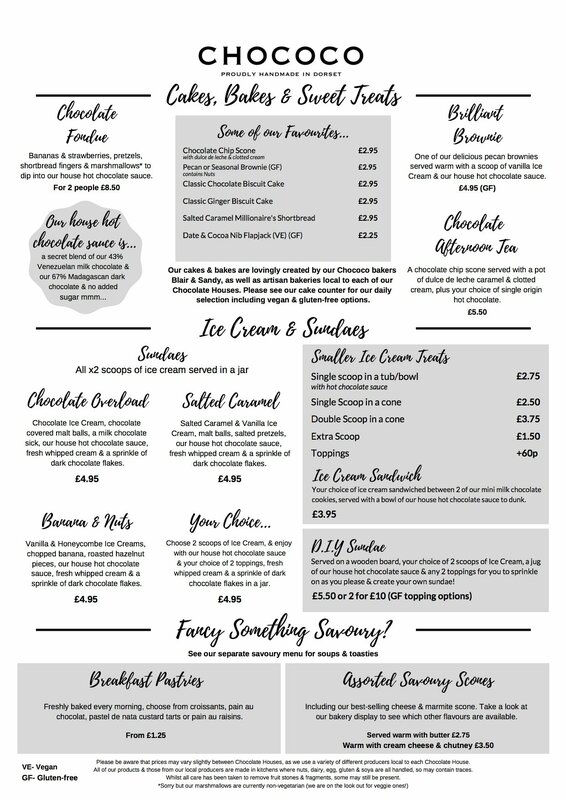 If you fancy an ice cream, we now have our new Chococo Gelato made in-house to delight. If you prefer something savoury, we offer freshly made toasties, savoury scones and vegan-friendly soups for a light lunch. By the way, several of our cakes & bakes are either gluten-free or vegan-friendly. However, as we do make & serve everything by hand in spaces in which gluten & dairy are handled, we cannot give any guarantees of anything being 100% free-from. We also offer children's parties, chocolate workshops & tastings for adults on site. Please contact the team directly on horsham@chococo.co.uk or pop in to discuss!